There are many places to visit and see so I have given some information on the region and places that you might find of interest. Languedoc covers roughly the region between the Rhone and the river Aude, extending northwards to the Cevennes and the Massif Central. The name is derived from Occitan (French: Langue d'oc), the language spoken in the region before French became the universal language of France. The Languedoc has been settled by the Greeks, Phoenicians and Romans. It has also been invaded and plundered by the Alamanni, Vandals, Visigoths and Saracens. Some parts of the region have been part of the dominions of the Kings of Aragon and the Kings of Majorca. It did not come under French control till after the 16th century. Aude stretches from the Mediterranean to the Pyrenees, the Aude Cathar Country possesses such a variety of landscapes and prestigious sites as to satisfy the most demanding of visitors. In natural, spectacular locations you will discover not only the Cathar Country castles, but also the Medieval City of Carcassonne (UNESCO World Heritage Site), the Romanesque abbeys and cloisters, or the pink flamingos which populate the coastal lagoons. You can also linger in the centuries old shade of the Canal du Midi (classified a World Heritage Site by UNESCO as well), walk along the edges of our many lakes or visit the coast and paddle in the Mediterranean. The area also is world renowned for its fine wines and gastronomy. Most think of Cassoulet when they visit the region but that is found in the North West of the department. In the more central area Fréginat is the regional delicacy which is made from pork liver, pork meat and beans. Down on the coast Borrida d’anguilles which can best be described as an eel stew. One of the three primary gorges on the river Aude is located some 100 metres from our house. The gorge with its high cliffs was created thousands of years ago by the passage of the Aude through the sandstone rocks. 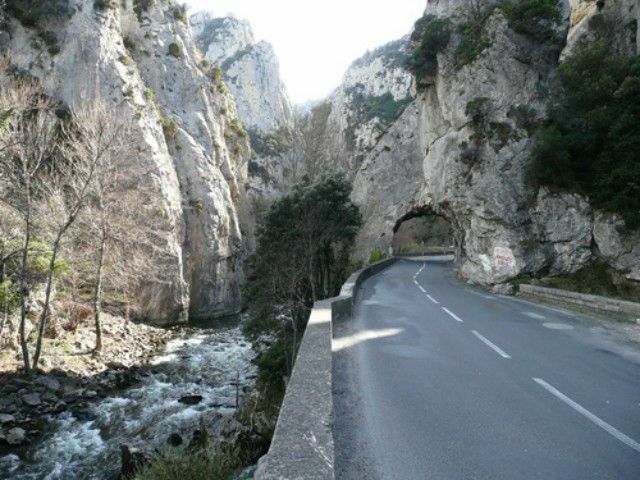 In 1774, Felix Armand was named parish priest of Saint Martin Lys, a small village boxed in the gorge of the Aude. This place, like the whole of the high valley, suffers from the enclosing mountains of the gorge and was a danger to the travellers who risked traversing the paths of the high precipice. Felix Armand decided to create a project to build a road through the gorge for travellers to use. Paying for this himself and totally aware of the risks involved he mobilises his parishioners and starts work. The Revolution interrupts the building and Felix Armand had to take refuge in Spain before clandestinely returning to continue both his ministry and work with the support of his parishioners. The work was however recognized by the authorities and the construction could be carried out in the long term through the First Empire and Restoration. 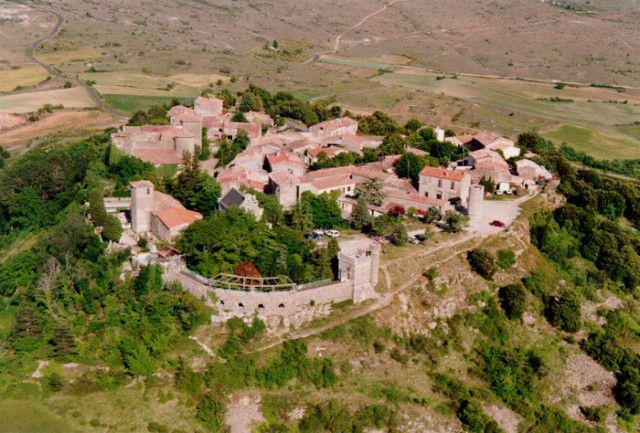 Our nearest major village is Quillan some four minutes away by car and is built on the side of the Colline de Vitrages (Vitrages Hill) at the foot of the Trois Quilles. There is a variety of shops, bars and restaurants located here. 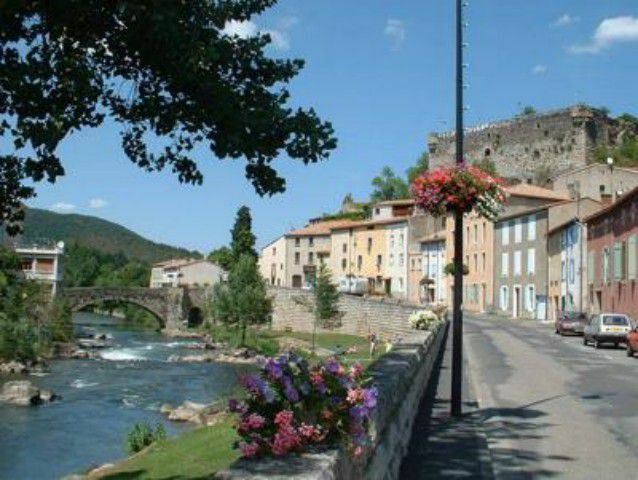 The village, which is dominated by the ruins of an imposing fortress, is on the banks of the Aude and enjoys a truly magnificent setting in the middle of a circle of mountains, and in a area full of pine forests, streams and valleys. Just down the road is the Rebenty Valley, a fishermans paradise strewed with streams and fish breeding farms. In Quillan on the Esplanade de la Gare (Station Parade), you will find a statue of Abbot Felix Armand who, by opening a road towards Spain (now called the D117) through the Pierre-Lys Pass, helped open up the region. There is an excellent street market on Wednesdays. 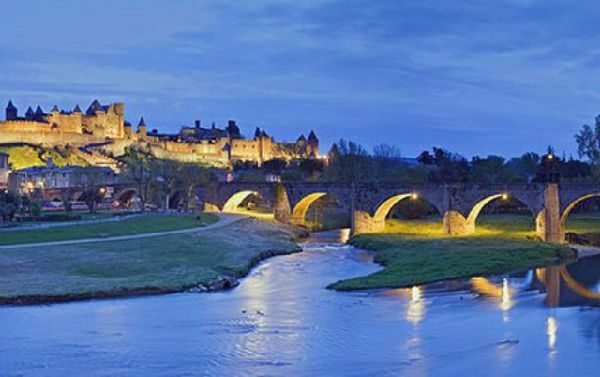 Situated in 25 km of Carcassonne, Limoux is the major town of the region with some 10,000 inhabitants. Although inhabited since Neolithic times the town was actually founded in the 8th century but now centred on the 12th century church which with the active support of a heretic bishop, served as a refuge for the Cathars. Twice besieged and taken, all its inhabitants were excommunicated for their revolt. From the middle ages to modern times the town has lived from the cloth making industry, cereal growing and winemaking. In spite of its fortifications, Limoux wasn't spared the ravages of the Hundred Years War or the 'War of Religions'. In the 19th century, the cloth making industry was replaced by shoemaking, whilst winemaking increased in importance. The Place de la Republique and its arcades constitute the lively town centre. Saint Martin's Church still has a nave and Romanesque porch dating from the original construction. In the heart of "Cathar Country", Limoux is perfectly in harmony with its mountain, its surrounding vineyards, the guarrigue, and the very close sea. 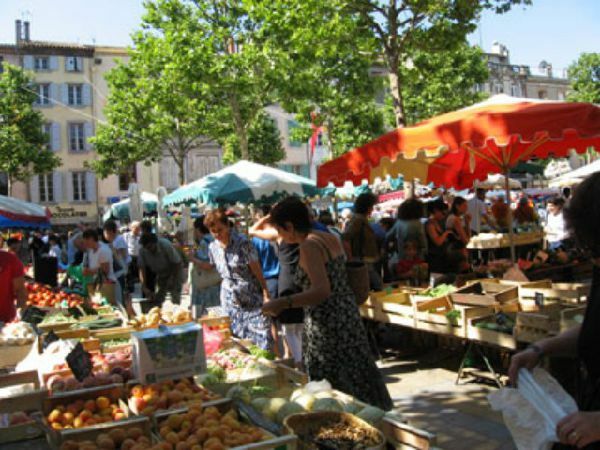 Its Mediterranean climate (similar to Quillan) allows in a better way the city to express its quality of life emerging from its fabulous soil products. 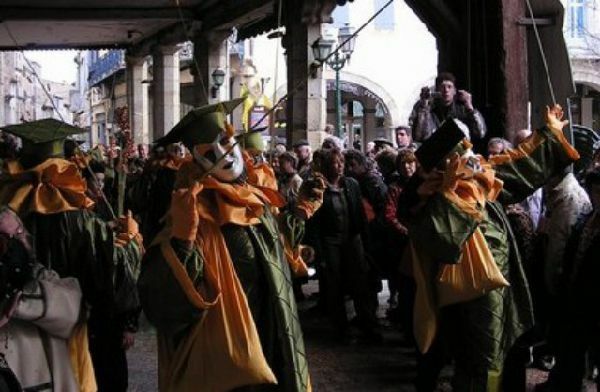 Every year, Limoux organizes its carnival which looks like no other one. It lasts 3 months, starting in January and ending in March. The gastronomy is almost vital in its culture: you can discover pébradous (cakes with pepper) in aperitif, artichokes salads, the duck cooked in the way called limouxine (cooked with saffron and garlic), the nougat, the candies and the chocolates. 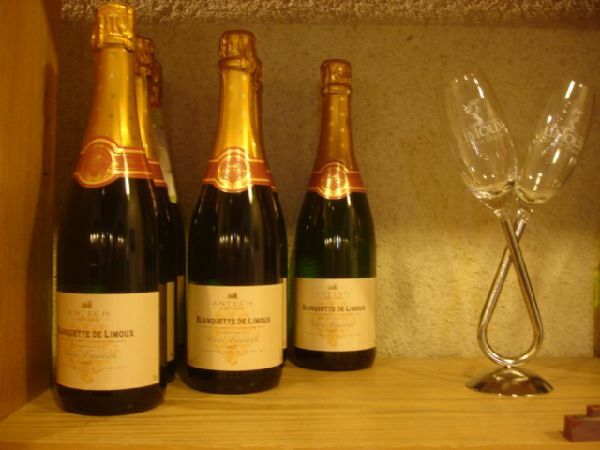 The Blanquette de Limoux is probably the world’s oldest sparkling wine. In 1531, a monk from Saint-Hilaire Abbey, whose responsibility it was to watch over the wine after the harvest, noticed that the wine (bottled and corked) had 'worked' and formed a mouse. The method was refined over time, but the fine bubbles still come from three authorised cepages (variety of grapes), the mauzac, the chardonnay and the chenin, which produce the Blanquette, the Cremant and the Chardonnay de Limoux. All three of these wines are classed as some the most famous in the world. At the entrance to the high valley, the site was well known to the Romans who took the cures at the waters. This can be seen from the result of archaeological digs (the remains of the roman therms) and from the piers of the bridge over the rive Aude. Alet subsequently an episcopal town. 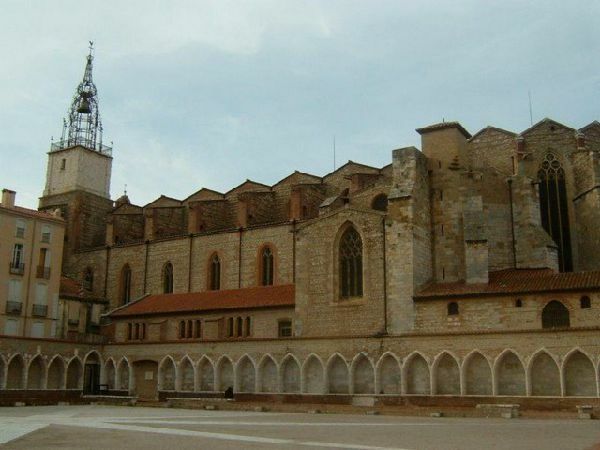 Some maintain that the apse of the abbey church was built on the site of an ancient temple to Diana. 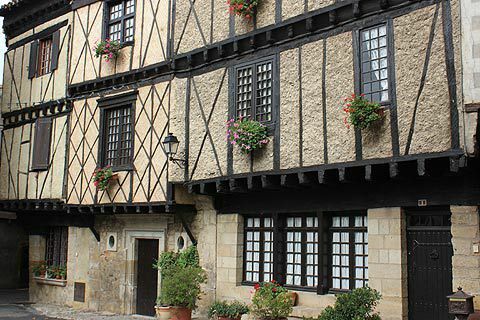 From its ancient past, Alet has kept a certain mediaeval look, with remnants of its ramparts, and half timbered or corbelled facades lining many of its old streets. The therms are fed with water by a spring which is rich in chalk and bicarbonate and which is used for thermal cures as well as being bottled for consumption. In the surrounds, Saint Salvayre Peak offers a unique panoramic view over the Pyrenees and Corbieres. Rennes Les Bains is a thermal town where patients go to 'take the waters'. These have taken 15,000 years to reach the earth’s surface. Filtering through faults in the rock, they arrive, full of iron, at a temperature of 43 deg C. The old wash houses have now been converted into open swimming pools where you can bathe till your heart’s content. January 24, 1917: A few people are standing in the small churchyard in Rennes-le-Chateau, watching silently as the coffin of Berenger Sauniere is lowered into his grave. Of these people, how many truly know the secret that is being buried with this charismatic priest? This question was not of much interest to anyone for the 50 years that followed the burial; yet when the story was rediscovered in the 1960s, it awoke the curiosity of many people both in France and abroad. From then on the phenomenon only increased, and led to the writing of many books (some more reliable than others), but unfortunately no solution has ever been found to explain the mystery of Sauniere's sudden wealth. Well it is a good story and an interesting place to visit. There is also a nice gentle 2hr walk starting from and returning to the car park. In the 12th century a castle (Château de Puivert) stood on this site which had strong links to both Cathars and troubadours. A meeting of troubadours took place here in 1170, and in 1185 festivities attended by the Viscount of Carcassonne and Loba, Lady of Cabaret. At the time of the Wars against the Cathars its seigneur was Bernard de Congost. His wife Alpaïs had become a Cathar Parfaite before her death in 1208. In November 1210 the Castle was besieged by Simon de Montfort, and fell after three days. The Congost family continued the fight against the invaders. Bernard died after receiving the Cathar Consolamentum at Montsegùr in 1232. His son continued the fight, participating in the events of Avignonet in 1242 and helping defend Montsegùr in 1243-4. In 1213 the seigneurie, now in French hands, was conferred by Simon de Montfort on one of his lieutenants, Lambert de Thury. Later it was allocated to the Bruyère family. The present castle is French, built by the Bruyère family in the 14th century, probably around 1310. It is still in relatively good condition. A walled city couldn't be easier to reach and for anyone travelling through this region it is a must. 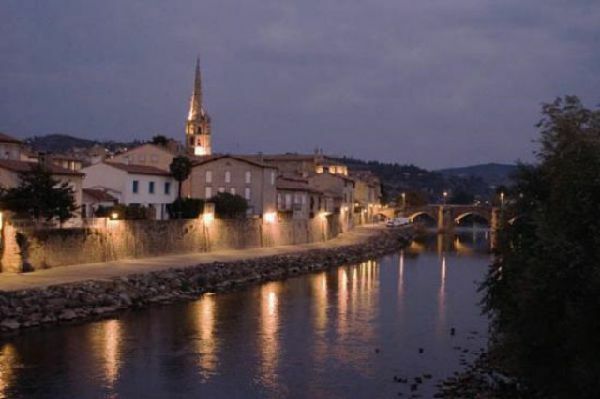 It is one of the most dramatic, if also most-visited, towns in the whole of Languedoc. Carcassonne owes its division into two separate "towns" – the Cité and the Ville Basse – to the wars against the Cathars. Following Simon de Montfort's capture of the town in 1209, its people tried in 1240 to restore their traditional ruling family, the Trencavels. In reprisal King Louis IX expelled them, only permitting their return on condition they built on the low ground by the River Aude. Why put these two together, well they share a lot of common history as you will see. Both cities are around 10 to 15 minutes from the Mediterranean coast boasting kilometres of sun drenched golden sandy beaches. Over to the south, climate and geography alone would ensure a palpable Spanish influence. But more than this, a good part of PERPIGNAN's population is of Spanish origin – refugees from the Civil War and their descendants. The southern influence is further augmented by a substantial mixture of North Africans, including both Arabs and white French settlers repatriated after Algerian independence in 1962. 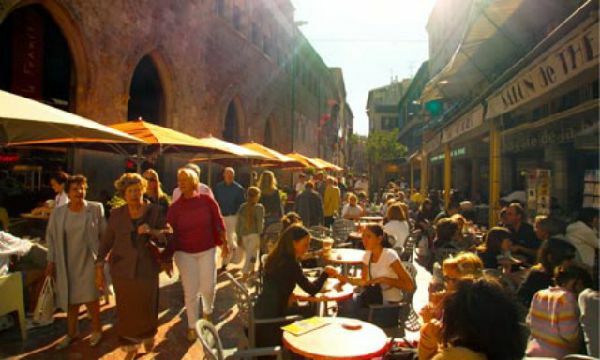 While there are few memorable monuments to visit, Perpignan is a pleasant city with a lively street life. Its heyday was in the thirteenth and fourteenth centuries, when the kings of Majorca held their court here, and it is from this period that most of its historical interest derives. Narbonne was established in Gaul in 118 BC, as Colonia Narbo Martius. It was located on the Via Domitia, the first Roman road in Gaul, built at the time of the foundation of the colony, and connecting Italy to Spain. 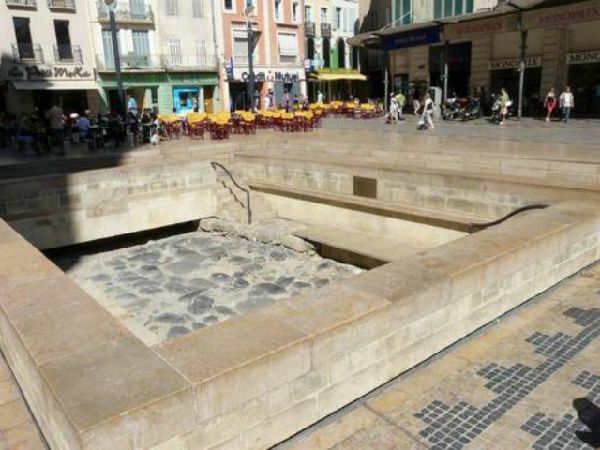 Geographically, Narbonne was therefore located at a very important crossroads because it was situated where the Via Domitia connected to the Via Aquitania, which led toward the Atlantic across Toulouse and Bordeaux. In addition, it was crossed by the Aude River. Politically, Narbonne gained importance as a competitor to Marseille. Julius Caesar settled veterans from his 10th legion there and attempted to develop its port while Marseille was revolting against Roman control. 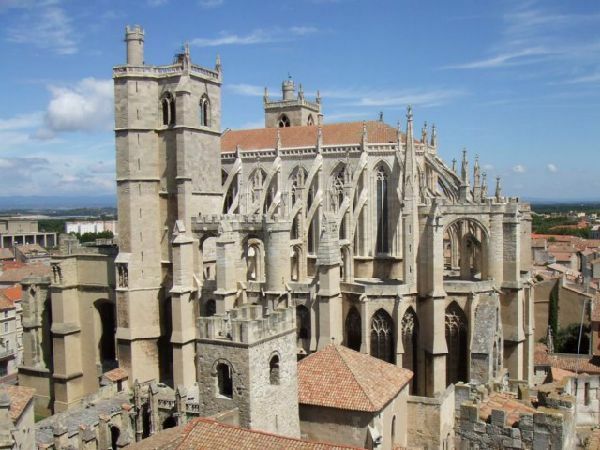 Later, the provincia of southern Gaul was named "Gallia Narbonensis", after the city, and Narbonne was made its capital. Seat of a powerful administration, the city enjoyed economic and architectural expansion. It was subsequently the capital of the Visigoth province of Septimania. It was part of the Emirate of Cordoba until conquered by the Franks after which it became part of the Carolingian Viscounty of Narbonne. 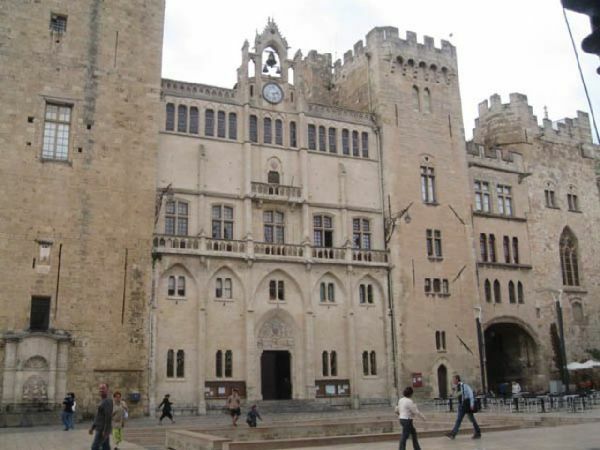 In the 12th century, the court of Ermengarde of Narbonne (reigned 1134 to 1192) presided over one of the cultural centres where the spirit of courtly love was developed. Well we are in the heart of Cathar country (nearest castle just 15 minutes, furthest just over an hour) so here is some basic information for those that want to visit some of our castles and a link to further information on them courtesy of Languedoc France another excellent source of information on the area. First the bad news, there is very little remaining from Cathar times, castles or anything else. 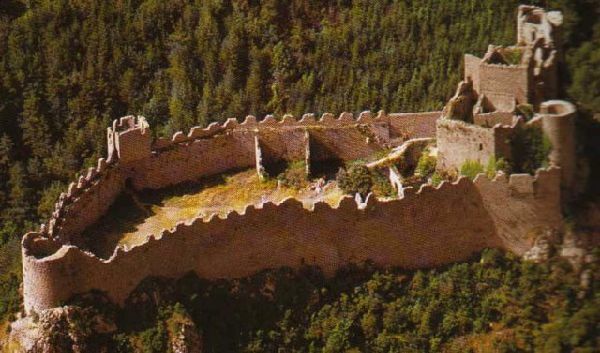 All of the main "Cathar Castles" advertised to tourists as romantic vestiges of the Cathar period are no such thing. 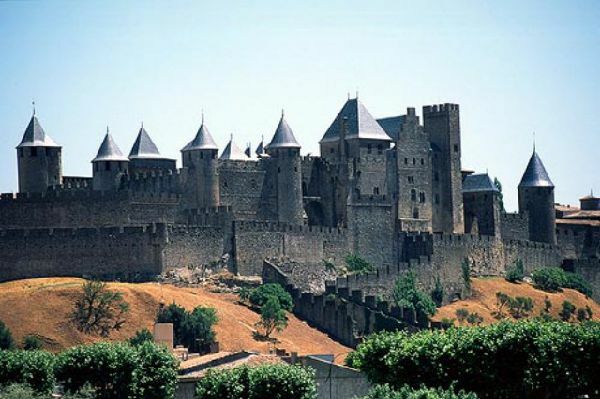 They are generally castles built by the French after the Cathar Crusade, and used to defend their new border with Aragon. These castles were slighted, or left to decay, after the Treaty of the Pyrenees in the seventeenth century. The justification for the deceit is that they are often built on the site of earlier castles occupied by vassals and allies of the Counts of Toulouse during the Cathar period. 1. Genuine Cathar Castles, advertised as Cathar Castles. There are very few of these, although you may find a few vestiges near to existing structures (eg castles at Peyreperteuse, and Puivert). Carcassonne probably has the best claim to be a Cathar Castle, followed by three quarters of Cabaret (Lastours). 2. 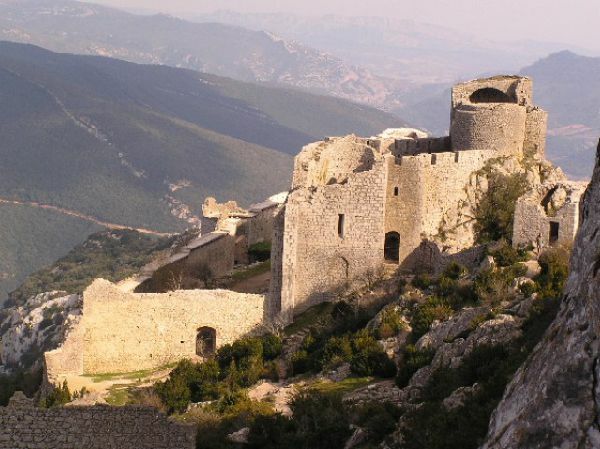 Later French Castles built on the site of Cathar strongholds, advertised as Cathar Castles. 3. 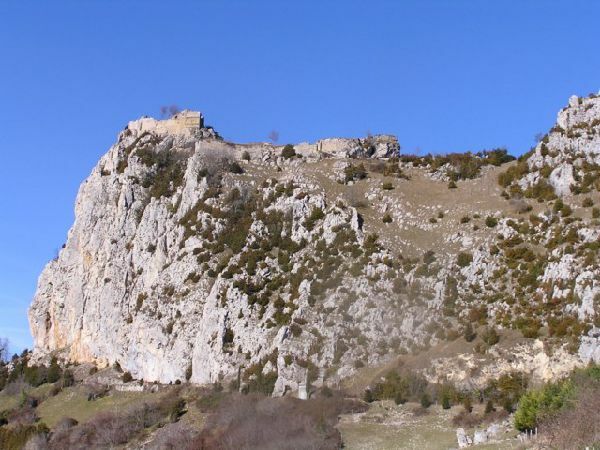 French Castles with no Cathar connections, but sometimes advertised as Cathar Castles such as Arques. 4. Cathar Castles not generally advertised as Cathar Castles although they are, Pieusse, Le Bézu, Usson. 5. Sites of Cathar Castles: Béziers, Toulouse, Bram, Marmande, Lavaur, Minerve, Beaucaire, Castelnaudry. 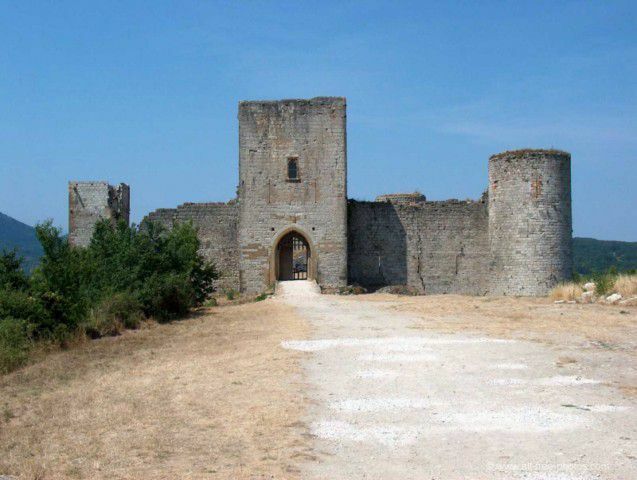 There are also castles of interest because of their links with events during the Cathar period, for example: Avignonet, where Cathar sympathisers helped some particularly unpleasant Inquisitors into their next incarnations. Villerouge Termenès, a castle belonging the the Archbishop of Narbonne, where the last known Cathar Parfait in the Languedoc was burned alive, and Montailliou, the home of Beatrice de Plannissols, a major character in the events following the arrest of a whole village by the Inquisition on suspicion of Cathar sympathies. The above is just a sample to wet your appetite. There are plenty of museums to visit covering such subjects as dinosaurs through musical instruments to hat making for those inclement days. We have thirteen official most beautiful villages in France (Aiguèze, Castelnou, Eus, Evol, Lagrasse, La Garde-Guérin, La Roque-sur-Cèze, Minerve, Mosset, Olargues, Saint Guilhem le Désert, Sainte Enimie and Villefranche de Conflent). In the early 20th century Collioure (hour and 20 minutes by car) became a center of artistic activity, with several Fauve artists making it their meeting place. André Derain, Georges Braque, Othon Friesz, Henri Matisse, Pablo Picasso, Charles Rennie Mackintosh, James Dickson Innes and Tsuguharu Fujita have all been inspired by Collioure's royal castle, medieval streets, its lighthouse converted into the church of Notre-Dame-des-Anges and its typical Mediterranean bay. Collioure's cemetery contains the tomb of Spanish poet Antonio Machado, who fled here to escape advancing Francoist troops at the end of the Spanish Civil War in 1939. 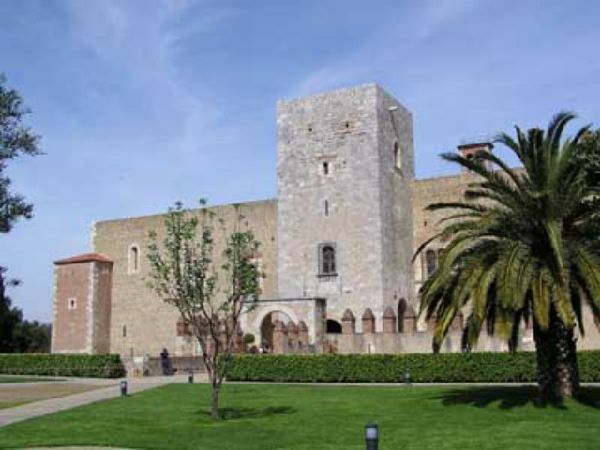 We can suggest a nice day trip out which, after a seafood lunch, freshly caught locally, you continue to Figueres and visit the home of Salvador Dalí and the adjacent museum dedicated to him and his art. The list of things to visit and places to explore just goes on and on which possibly explains why this is one of the most visited regions in France so we look forward to seeing you soon.